LOS ANGELES >> Police sought the public’s help Saturday in finding a 71-year-old Pasadena man with Alzheimer’s disease who went missing in downtown Los Angeles Friday evening after being released from jail following a DUI arrest in downtown Los Angeles. 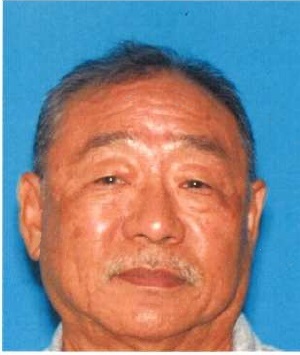 Gerald Masao Sakamoto was last seen just after 7:30 p.m., when he was released from the Inmate Reception Center in Los Angeles, according to Pasadena police and Los Angeles County booking records. He had been arrested on suspicion of intoxicated driving by officers from the California Highway Patrol’s Glendale-Verdugo Hills area office about 3 a.m. after being involved in a freeway crash. But two-and-a-half hours later, Sakamoto was nowhere to be found, Pasadena police Lt. Jason Clawson said. His wife reported him missing. Sakamoto suffers from medical issues, including Alzheimer’s disease, police said. He’s described as Asian, 5 feet 3 inches tall, 165 pounds, with black hair and brown eyes. Anyone with information is asked to contact the Pasadena Police Department at 626-744-4241. This entry was posted in Los Angeles, missing, Pasadena by Brian Day. Bookmark the permalink.